With the TomTom GO 910 you get detailed maps of the whole of Europe and the USA and Canada, all preloaded on a 20Gb hard disc. TomTom GO 910 can navigate by announcing the actual street names and even read out your SMS messages. You can download over 10,000 songs, play through the high quality speakers and manage your music through the ingenious TomTom Jukebox. TomTom GO 910 has been discontinued. Accessories, spares and parts are still available for your GO 910. The TomTom GO 910 GPS satellite navigation system is preinstalled with Europe, the USA and Canada on 20Gb hard disc. Plan your route to fit your requirements, such as: quickest, shortest, avoiding toll roads and congestion charge areas, by required arrival time, etc. The TomTom GO 910 features text-to-speech announcing street and place names. Also the included remote control means you or a passenger can operate your TomTom GO 910 from anywhere in the car. Making your journey easier and safer. There are 1,000's of Points of Interest pre-installed including Café, car park, cinema or petrol station. Search by proximity to current location, on your route, near a specific city, etc. Connect the TomTom Go 910 to your mobile phone (make & receive calls as you drive with just a touch of the screen), headset, car speakers or headphones hassle-free with Bluetooth technology. The TomTom Go 910 built-in MP3 player with 20 Gb hard disc, enough for over 10,000 songs and pictures and even read you out your SMS messages. The TomTom GO 910 features TomTom Jukebox and includes speaker. So you can make and receive calls as you drive with just a touch of the screen. The TomTom GO 910 has been designed to be a portable plug and play device, and as such can be transferred from vehicle to vehicle with ease by the user. The TomTom GO 910 is installed via the suction mount and docking shoe. TomTom GO 910 works with Tele Atlas Maps to provide detailed maps across Europe, the USA and Canada. Tele Atlas Maps provide high quality, detail rich maps, which in addition to street information include features such as route calculation, Points of Interest, Estimated Time of Arrival, and more. Looking for genuine accessories and spares for the TomTom GO 910? 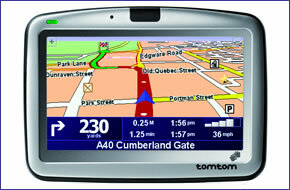 All parts are genuine TomTom product and specifically designed for use with the GO 910 sat nav. Accessories available to purchase include deluxe carry case, car charger, external microphone, iPod and audio cable and a mini USB cable. Do you have a question about the TomTom GO 910? Submit your question via our contact page.